It's a common complaint among diehard reality-watchers that when young singing-show contestants take on older artists' material, their lack of life experience makes it impossible for them to bring enough true grit to the stage. 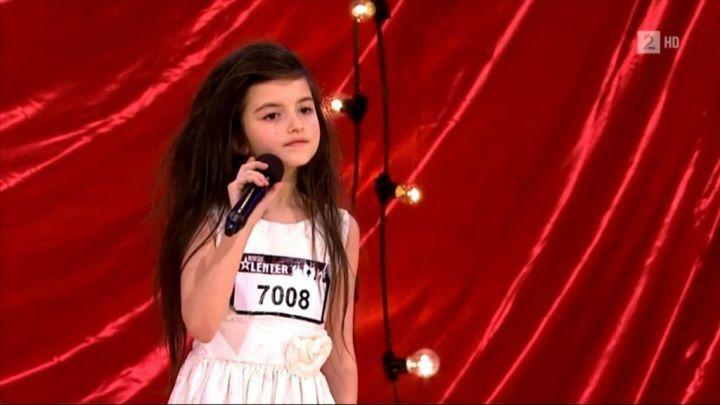 But when tiny "Norway's Got Talent" hopeful Angelina Jordan took on Billie Holiday's "Gloomy Sunday" this week, she not only somehow tapped into the world-weary song's raw emotion, but she seemed to be channeling Billie herself. And she's only 7 years old. Angelina's audition of the late jazz legend's 1941 version of the maudlin ballad — a song about social injustice and personal heartache so deeply depressing, it was reportedly banned by the BBC for being damaging to wartime morale, and has been linked via urban legends to multiple suicides — brought to mind a baby Billie. Or at least a baby Amy Winehouse. And her performance elicited both tears and a standing ovation from the stunned judges. But just how much did this sweet child grasp the gravity of what she was singing? "I felt something special about it. It's hard to explain in words," said Angelina, explaining to a Norwegian television station that she speaks English and "understood [the song] very well…when I sang it for my mum, she said that this song is nice, but it was an incredibly sad song." This young girl obviously has a very old soul. And she obviously made it to the next round of the competition. Check out her performance of "Gloomy Sunday," which is going viral as of this writing, and prepare to be wowed.